The National leader of the All Progressives Congress, APC and a former governor of Lagos State, Asiwaju Bola Tinubu is in a state of dilemma, weighing his options over the re-election bid of the incumbent governor, Mr Akinwunmi Ambode, COMPLETE NEWS can authoritatively report. A highly placed source closed to Bourdillon confided in this medium that the godfather had deep reservations about the governance style and the meddlesomeness of the governor in the grassroots politics in the state. According to the source, the governor had been building massive political structures across the local government areas in the state, a move which Tinubu frowned at as an affront on his firm grip of the structures in Lagos. “Governor Akinwunmi Ambode founded and is funding Liberal Minds Grassroots Movement, a political group which is working for his interest and other groups that are positioned to ensure his re-election regardless where the pendulum swings in the political calculations from Tinubu camp”, COMPLETE NEWS gathered from the source. 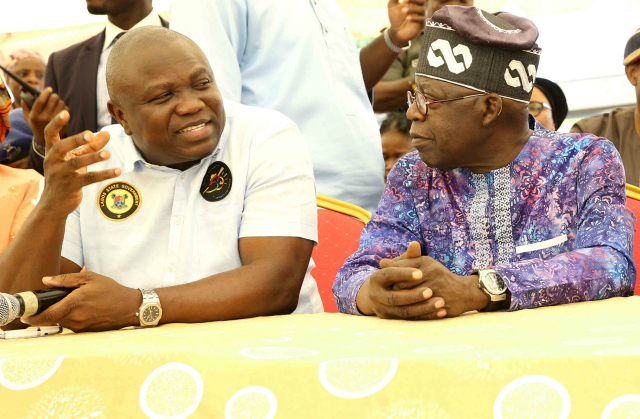 It was also gathered that Tinubu was not happy with Ambode over the role he played in 2017, in the composition of the local governments administration team without recourse to many party leaders at the grassroots. The action of the governor generated tension in the polity to the extent that some chieftains like the speaker of the House of Assembly, Mr Mudashiru Obasa, Hon Bayo Oshinowo (Pepper) and Hon Abdullahi Enilolobo , an ally of Osun State Governor, Rauf Aregbesola defied the governor and sworn in their own preferred candidates in their respective domains. The source added that Tinubu over-ruled Ambode on the matter at a critical meeting held at Isaac John, Ikeja GRA ordering the governor to maintain the status quo. Tinubu was quoted to have said that his strength lies in the people especially leaders at the grassroots arguing that he could not support any moves that will jeopardize their interests. The governor’s lack of capacity to manage tendencies within the party is a great concern to Tinubu, another source in ACME told this medium. COMPLETE NEWS gathered that Tinubu was worried if he could still remain relevant if Ambode gets second term as he has little control over critical decisions the governor makes. For instance, Tinubu had told Governor Ambode to disband a special purpose vehicle, Visionscape which was formed to displace local waste managers. But the governor refused, a highly placed source in Alausa told COMPLETE NEWS. Tinubu had argued that it would be politically suicidal for the government to disband the PSP operators with over 25,000 workers . According to him, the PSPs work force, highway sweepers are part of the core of his political machinery in the state. The National leader openly expressed his frustration at a truce meeting he had with the aggrieved PSP operators who had a running battle with governor over his decision to throw them under the bus for Visionscape, a purported foreign company. Tinubu waded into the feud when refuse crisis in Lagos became a national embarrassment. While appealing to the waste managers to return their duty posts, Tinubu said he was never taken into confidence over the Visionscape adding that he only return from foreign trip to see Visionscape in Lagos. In addition, it was gathered that ill-conceived 400 percent hike in the Land Use Charge that almost collapsed the Ambode government was not table before Tinubu and other critical stakeholders especially the elders of Lagos. Asiwaju Tinubu was said to have been thoroughly embarrassed by the action of the state government in inserting Apha Beta, a consulting firm allegedly owned by Tinubu in the Land Use Act. A competent source closed to Tinubu told COMPLETE NEWS that the APC National Leader was also miffed by how governor Ambode humiliated his trusted allies out of government. “ I can confirm to you authoritatively that Asiwaju(Tinubu) is very still unhappy with the way and manner the governor he sacked some of his (Tinubu’s) protégés in government. “Take for instance, the case of Mr Folorunsho Folarin-Coker, the erstwhile commissioner for Arts, Culture and Tourism who pioneered the One Lagos Fiesta that endeared Lagosians at the grassroots to Governor Ambode. Folarin-Coker was sacked on the television. He just saw his name being scrolled on television that he has been sacked by the governor. “ Folly (Folarin-Coker) has come a long way with Asiwaju. He was his personal assistant in 1999 before he later became his deputy chief of staff. Again, Folly’s father is one of the Agbagba (elders) of Lagos, he should not have been treated with such disdain. “Another sad case is that of George Noah, a former Managing Director of Lagos State Signage And Advertisement Agency (LASAA) who was rudely removed immediately Ambode took over the reins of power despite Noah’s bravery and sacrifice during the 2015 elections. In his book titled, ‘2015 Elections: The Politics of Outdoor Advertising In Lagos State”, Noah chronicles how the then government of Goodluck Jonathan placed him on the watch list of those who were hindering the success of their bid to take over Lagos. Mr Ganiyu Johnson, a relative of Tinubu, a former commissioner for works in Lagos was also said to have been frustrated out of office the governor. Tinubu is also said to be said sad on how Mr Fouad Oki was sacked as the Director General of Lagos State Safety Commission. It was gathered that the governor fired Oki for not meeting him on seat when he visited his office without seeking any explanation from him (Oki). Oki, a veteran campaign strategist, who had proved his competence over and again since the time of Tinubu, led the second term election of Tinubu in 2003 when the former governor fell out with the Afenifere leaders. While PDP Tsunami swept other governors on the platform of Alliance for Democracy in south west away, Oki-led campaign triumphed over the Obasanjo forces. Oki repeated the same feat for Fashola in 2007 and 2011 respectively. He also led the critical campaign of Akinwunmi Ambode in 2015 . Oki’s strategy and dexterity was said to have narrowly delivered victory for Ambode against Jonathan-backed Jimi Agbaje with a slim margin of about 100,000 votes in a state with a population of over 22 million people. According political observers , Oki remains a great political asset who could only be ignored to the peril of the establishment in the Lagos APC.